Maha Ananda Siddha who arrived at the mount at the behest of Lord Siva protects and blesses the devotees who visit the shrine, redressed their grievances, and cures them of all diseases and provides them everlasting joy and happiness on the earth and in the heaven. Besides, in order to enable the devotees to worship Mahadeva Swami in the sanctum sanctorum, steps have been constructed from the 16-pillar mantap, which itself has been constructed by making use of modern technology he has been carrying on many more renovation works. In a way that no one could think of nor could execute the project, the idol of Dakshinamurthy, the God of the South, which has been carved with dexterity and skill and which weighed about 1500 kilos was taken to the mount by the grace of God and was installed as per the command of Lord Siva. Not only that, by drilling the mount, he constructed a huge prayer hall for meditation and further he constructed the statues of 18 Siddhas in the rock itself so that the devotees could remember them. These are but a few meritorious deeds of Maha Ananda Siddha. 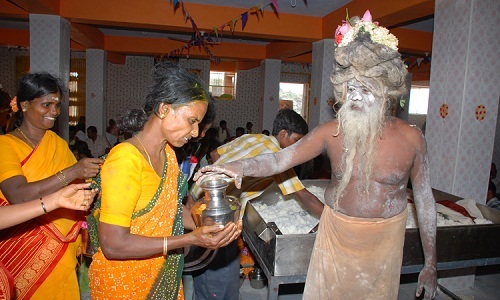 Though Mahananda Siddha does not take a single grain of cooked rice, daily he provides food to hundreds of devotees and he prepares the food with his on hands.